The larger wasps also carry off cabbageworms to feed their babies. A quick sip at the nectar bar, then back to the nursery with the baby food! ...but I think my garden is in trouble. DD forgot to turn the sprinklers off this evening and when I reminded her, she turned on the backyard floodlight to go turn the sprinklers off...then forgot to turn off the lights. I sent DD2 to remind her to turn them off, and while I was looking out the upstairs window at the flood-lit garden, I saw two big dark lumbering bodies sniffing at the gate to the 4 ft high fenced SF&H bed. At first I thought they were overfed, long-haired cats with bushy tails... but when I yelled out the window “Hey! What do you think you are doing there!” (Yes I speak conversationally to animals ...and insects and plants....) one of them looked up at me with masked face. RACCOONS! Of course just as they started to leave for the back fence in response to my “You’re not supposed to be here! Get outta here! Shoo!” ...DD turned off the flood lights. I got the high beam flash light and shined it into the dark near the fence and heard them making their way over the fence and into the woods on the other side. But I know they will become bolder. 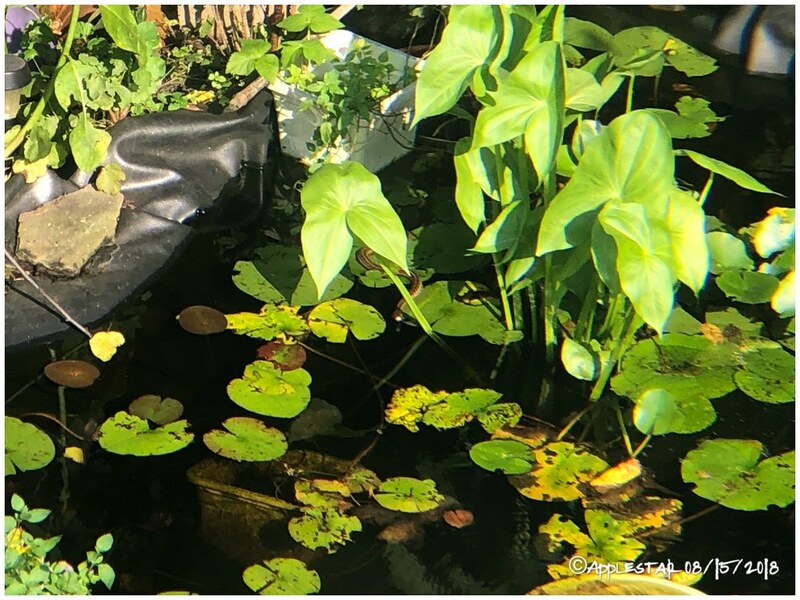 Well, that explains the turned over buckets and trampled pond-edge plants, one of my bog plant containers mysteriously having been pushed into the deep part of the pond and having to be fished out on Friday.... The resident Green frog has been silent — hopefully he is just hiding. Subject: Will a kind soul please help me plan my veggie arrangement? - Yesterday afternoon, I glanced out the back window and saw a giant groundHOG in the backyard ! Banged on the window and scared it away, but I also replaced the batteries in my motion sensor lights and door chime/alarms to restore their sensitivity and sound/light levels. - This morning, I let our two indoor kitties out on “supervised” outing. While I was tending the garden, one of them started making her “strangled meow” — I caught something! — noises. Rushed over to find frog belly and legs sticking out of her very full mouth! Immediately picked her front end up and lightly shook her to get her to let go —“You are NOT a ShadowClan cat!” The frog hopped into the grass under the glasstopped table, so hopefully it was not fatally injured. - This afternoon, looked out of the window and noticed a ropy thing moving under the water in the pond. It took a minute, but realized it’s the snake! Watched it thrashing around under water, swimming all over under the Waterlilies. Eventually it came out and spent some time sunning on the lilypads. — would you agree it must have been chasing something(s) in the water? 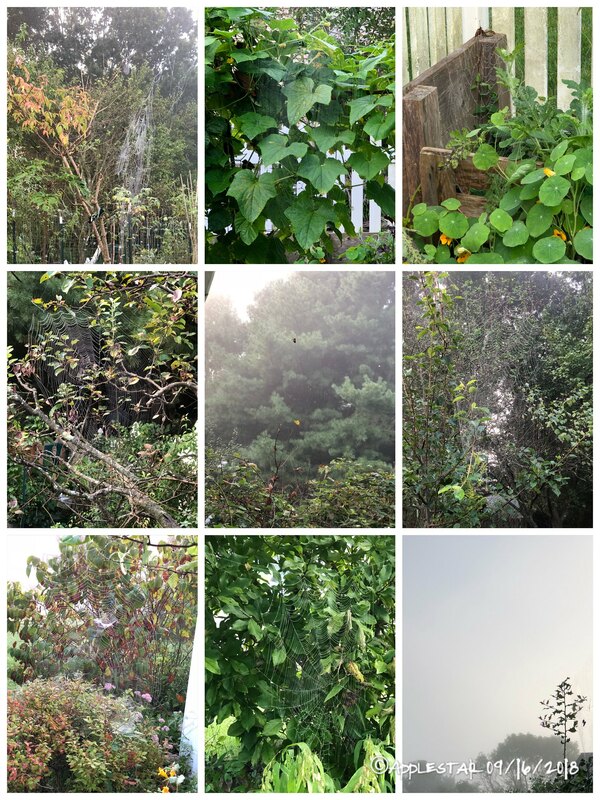 Daily routine — look out of the window, scan around until spot the hummingbird at one of favorite feeding spots, monarch butterfly feeding or flying territorial sweeps, and a black butterfly with a brilliant metallic blue streak on upper side of the wings which I haven’t been able to ID yet because it never lands — possibly Red Spotted Purple if it’s not a Swallowtail — That always seem to fly-by just below the window. ...and perpetual white cabbage butterflies. It does make me really happy that the Monarch butterflies and hummingbird(s) are regular visitors in my garden. I was just looking out of the window again and realized that the dragonfly air squadrons are here today. They are flying back and forth, mostly in the wide open space of the front lawn, but also in the airspace above the more cluttered backyard. They are hopefully clearing some of the mosquito outbreak after the rains we had over the weekend. I was feeling like they have been more of them and becoming bothersome. I saw one of the black butterflies make a sharp turn away from the front yard and swoop into the leaves of e fruit espaliers. Hopefully everyone else will keep clear, too, while the air show is going on. This morning, I was out at first light, even before the sun had cleared the houses and trees — it had gone down to 56°F was only a few degrees warmer at that point. No birds out and about yet, I thought... then I went around the corner of the house and ran into a pair of hummingbirds flying at each other, chittering and swooping. Wow, they are up early! 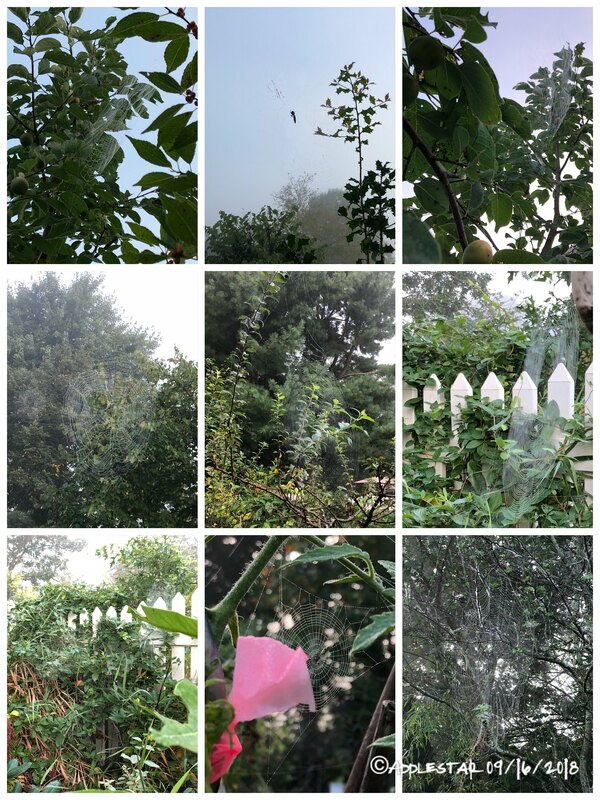 applestar wrote: Yesterday morning dawned foggy — perfect for taking photos of all of the large spider webs I could find. They are mostly 3 to 4 feet or more across. The only exception is the one with pink ribbon — that one is a tiny web, maybe two inches across. 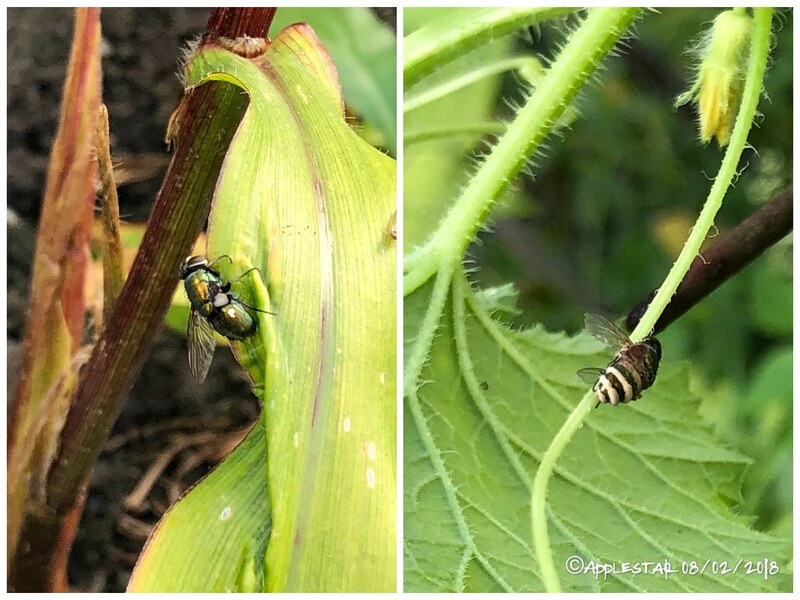 I nearly missed it, but there must have been one of those hatching events that attracts dragonfly and swallowtail flyovers yesterday. I was so intent on things going on at ground level I don’t think I ever looked up. I did see a solitary large dragonfly flying in the backyard over the pond, but that was the extent. After coming inside, I was looking out of the upstairs window and noticed the swallows flying over the house and garden, and then also noted the dragonflies flying mid-level. I called to my DD to get her glasses on and come to the window so she can see them, but by the time she got back, they were gone. It was almost like they were only waiting for me to notice before leaving… at least that’s what my DD said. Haha. applestar wrote: I think I posted about one of these before – there was some kind of insect hatching event in my garden again. The videos I took today were pretty low quality, but, someday, if I ever learn to edit and splice these videos together into something presentable and learn how to post it in a way that can be shared, I will.